All Things Considered has changed! We have a new time on the station and a new format, but it&apos;s still the same high quality! 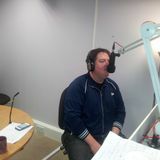 All Things Considered is now on ICR FM on Monday evenings at 7.30 - 8.30. Each week Kim is joined by a co-presenter to discuss current, relevant and quirky topics that are of interest to her- and therefore she hopes you! Politics, fashion, art, feminism, culture, society and everything in between- All Things Considered considers it all, and with music supplied by Fat Larry, we&apos;re talking Soul, Funk, Reggae and maybe even some Disco! You KNOW what you need to do... CLICK>>>PLAY>>> NOW>>>!